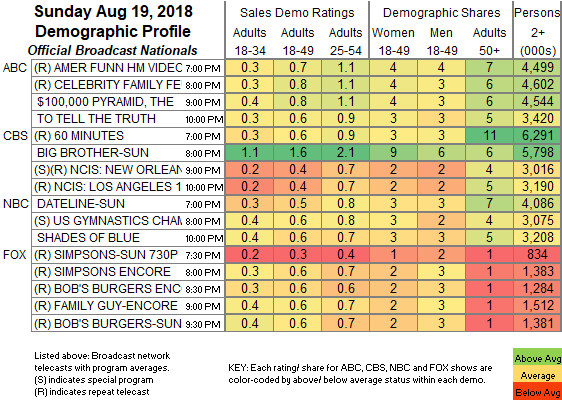 NETWORK FINALS: The 8:30PM rerun of BOB’S BURGERS gained 0.1 in final numbers. CABLE HIGHLIGHTS: Syfy’s SHARKNADO reign may be done. The latest title in the series scored 0.33, down 0.24 from 2017 (when it faced GAME OF THRONES), which was itself down 0.25 from 2016. Elsewhere, on Showtime, the season finale of THE AFFAIR ticked up to 0.11 (half the rating of the 2017 finale), WHO IS AMERICA dropped 0.04 to 0.07, and OUR CARTOON PRESIDENT was down 0.02 to 0.03/122K. AMC’s FEAR THE WALKING DEAD topped scripted Sunday cable, down 0.05 from last week’s midseason premiere to 0.63, with PREACHER down 0.02 to 0.26, and TALKING DEAD down 0.06 to 0.09. On HBO, BALLERS fell 0.08 from last week’s season premiere to 0.39, SHARP OBJECTS gained 0.06 to 0.38, LAST WEEK TONIGHT was up 0.04 to 0.38, and INSECURE was down 0.02 to 0.29. Hallmark’s CHESAPEAKE SHORE rose 0.04 to 0.23. The return of Discovery’s ALASKAN BUSH PEOPLE led cable overall at 0.78/0.58, and ULTIMATE NINJA CHALLENGE was up 0.09 to 0.25. On TLC, 90 DAY FIANCE jumped 0.15 to 0.76, and UNEXPECTED was up a tenth to 0.40. On E!, KEEPING UP WITH THE KARDASHIANS fell 0.12 to 0.46, and VERY CAVALLARI was up 0.02 to 0.27. VH1’s BASKETBALL WIVES was steady at 0.42. ESPN’s MLB SUNDAY NIGHT game was at 0.41. On Bravo, REAL HOUSEWIVES OF THE POTOMAC ticked down to 0.36. ID’s PAMELA SMART: AN AMERICAN MURDER MYSTERY was at 0.36/0.35, and AMERICAN MONSTER was up 0.02 to 0.31. 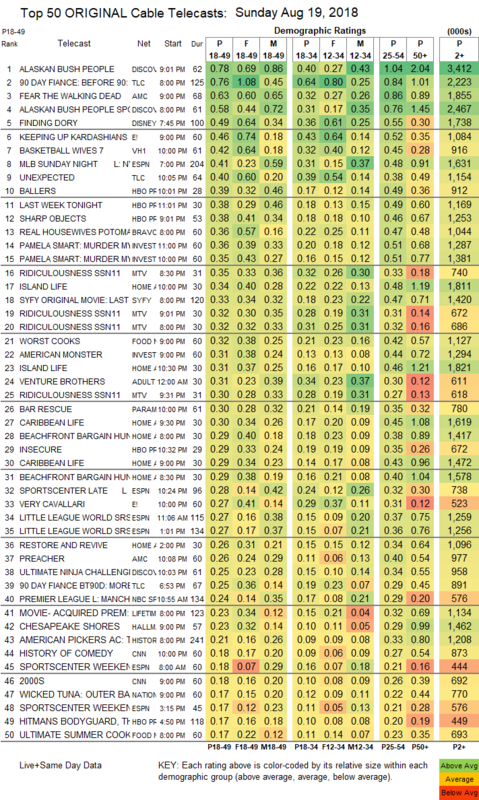 MTV’s RIDICULOUSNESS was at 0.35/0.32/0.32/0.30, compared to last week’s 0.34/0.33/0.31/0.29/0.29. HGTV’s line-up was led by ISLAND LIFE at 0.34/0.31, compared to last week’s 0.37/0.34. On Food Network, WORST COOKS IN AMERICA lost 0.03 to 0.32. Paramount’s BAR RESCUE rose 0.06 to 0.30.